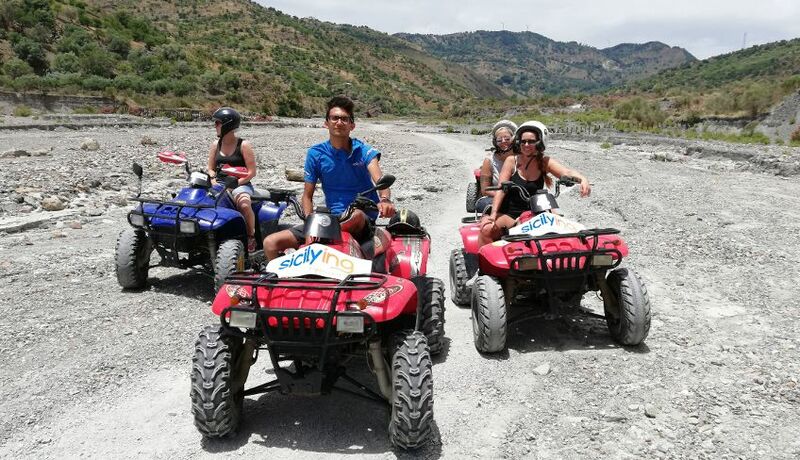 Four different proposals for your assisted Trip by Quad, discovering Etna and Alcantara river valley. Two short trips (1 h end 2,5 h) into the charming Alcantara Valley, 4,5 hours trip around Etna slopes and 3 hours Montagna Grande tour that will be totally Off-road. You will be free of driving your Quad alone or with a friend: each Quad can carry up to two persons. It is sufficient an ordinary driving licence B or driving licence A1 for under aged starting from 16 years old.Duration of the trip may vary depending on external factors. Alcantara Valley trip: you will see one of the most fascinating place of all ETNA territory. 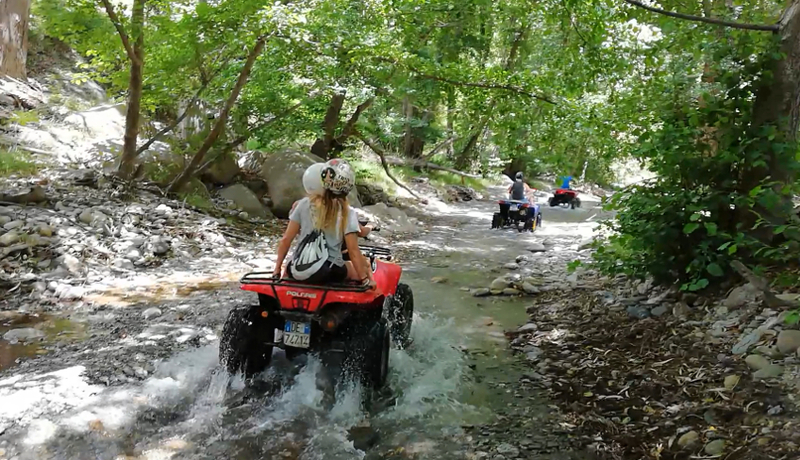 By ATV, you will leave from Gole dell'Alcantara to Francavilla di Sicilia off road. Here the view is suggestive and fascinating. During the centuries, frozen and wild water of Alcantara river has eroded an ancient lava flow, drawing a landscape similar to a canyon. You may also stop at Frati Cappuccini convent and at Antiquarium where archaeological items belonging to classic age are still preserved. 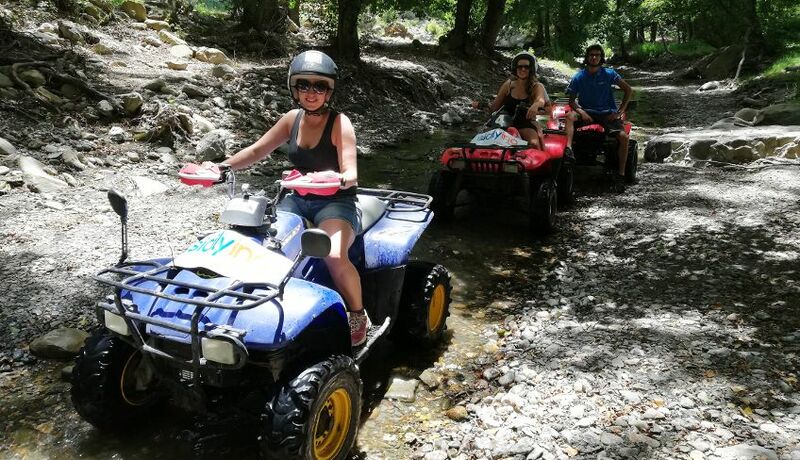 Etna trip: leaving from Gole dell'Alcantara you will reach an altitude of 1850 m. You will arrive to Castiglione di Sicilia through an off-road and naturalistic footsteps, where you will enjoy of an amazing view on the Valley. You will continue to Linguaglossa on cycling footsteps where you will admire the most distant crater of Etna: Vulcanetto di Moio Alcantara. You will cross several lava flows of different ages. Inside the forest you will reach to a very suggestive cave made of lava stones, and then you will arrive to Piano Provenzana. From here, real nature lovers may continue the trip paying an additional cost: you will leave quad and proceed on foot with a guide who will follow the group to the crater crated in 2002 or the craters on the pick (it takes almost 1,5 hour more). 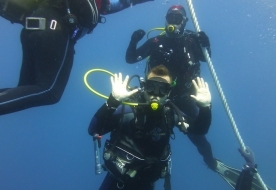 For the Etna trip excursion, only 2 departures everyday: at 9:00 am and 2:00 pm. Montagna Grande trip: all the trip is off-road. You will leave from Gole dell'Alcantara, direction Motta Camastra, up to Montagna Grande Pick. Up there you will see a unique view, from Eolie Islands to Calabria Coast and a complete view of Alcantara river, from its mouth to the estuary. The frozen and wild water of Alcantara river has eroded an ancient lava flow, drawing a landscape similar to a canyon. On the way back you may stop at the small village of Motta Camastra, famous for its impervious position. In case of the excursion to Mount Etna departing in the morning, you will make a stop for lunch. You can bring a picnic lunch or stop in at a local restaurant. Lunch is still your responsibility. During the off-road tracks you could get wet. We recommend to take a change with you. Suggested dress: closed shoes (better if tennis/gym shoes), wind stopper. You could get wet across the off road tracks. It is recommended to take with you a change of clothes. The meeting point is at main entrance of Gole dell'Alcantara Botanic Park, in Motta Camastra (ME) lungo la S.S. 185 (km 55). Once you will be inside the parking area of the Park, on the right side you will see a green gazebo. This is the meeting point. Free car parking. You may ask for a pick-up service from your hotel in Taormina, Giardini Naxos e Letojanni paying it separately. You are recommended to be there at least 30 minutes before the trip is scheduled to start. Before the trip starts, a short briefing will take place. An advance payment of 15% of the total amount is required for the reservation. Balance shall be paid on site. Only people being at least 16 years old and having a driving licence A1 can drive a quad. For adults, ordinary driving licence B is sufficient. Under aged people cannot carry passengers even if owners of a driving licence A1. You are recommended to be there at least 30 minutes before the trip is scheduled to start. The deposit paid upon booking is not refundable under any circumstances.